Visual: Pale yellow with brackish green tinge. Fast thick streaks. Water makes very cloudy. Nose: Medicinal. Reek of peat. Peppered beef slices. Peppercorn. Light salt. Water brings out more medicinal notes. Body: Beef slices. Peat smoke. Overdone steaks. Salt. Slightly tarry. Vanilla. Golden syrup. Some alcohol weight and warmth. Water makes smoother. Adds vanilla fudge. Pears. More medicinal notes. Apricot. Light bread. Lime cordial. Finish: Drying. Salt. Light vanilla. Tarry. Golden syrup. Apple pies. Water makes medicinal. Adds lime jelly and slight zestiness. Apricot. Conclusion: This is a big ‘un. Yet water makes it oh so mellow. Ok, I am kind of lying my balls off there. It is not mellow, but there is a whole other subtle set of characteristics under the peat assault that only come out when you add water. So, first of all let’s take a look at this without water. Whoa! This reeks, utterly reeks of peat. In a good way. It has huge intense smoke and smoked beef, mixed with peat, with medicinal notes in there as well. Without water a vanilla and golden syrup sweetness backs it up over time, but the rest of the intensity does not let up. Now at this point it is not complex, but it does show the advantage of a younger spirit in keeping the peat intensity up. It is heaven for smoke fanatics, while utterly lacking in subtlety. It happens slowly – drop by watery drop. First vanilla fudge comes out, then soft lime notes, then finally sweet apricot creeps out from under the peat nest it is birthed in. What the heck even is this? Apart from delicious I mean. Now it isn’t quite Lagavulin 16 level must have, but the range it runs with water – going from sheer assault, to still weighty but with a great range of fruit notes – well, that makes this a steal at the 40 quid ish price it goes for. Both heavy duty Islay, and complex restrained Islay in one whisky. I advise grabbing a bottle and adding water to your preference. Very impressive. Background: I had Port Askaig for the first time many a year ago at a whisky show. It was very nice, but I never did get around to grabbing a bottle of it for myself since. That mistake has now been rectified. 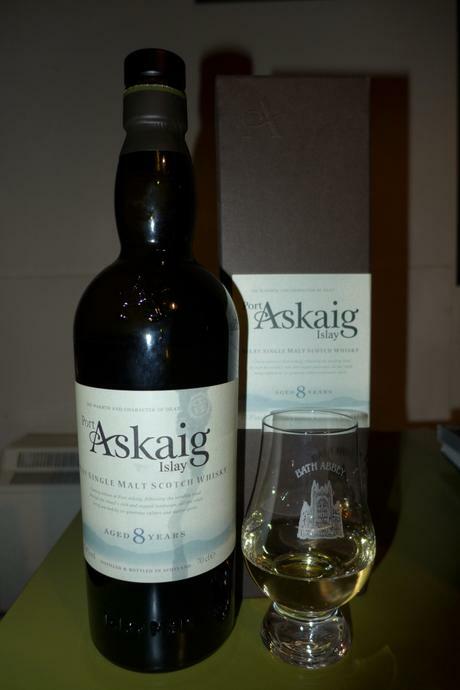 Port Askig is not a distillery, but a bottling of one of the other existing Islay distilleries under the Port Askaig brand. So far quality has been very high. The most common guess of what distillery it is from is Caol Ila and Ardbeg. I have no idea. Anyway, I grabbed this from Independent Spirit and broke it open with some Karnivool to listen to – Sound Awake to be exact. Saw them as a warm up band once, and enjoyed them enough to grab the CD there and then. Pretty soothing music for background noise.